The first number: $6 Billion, that is $6,000,000,000. The amount of money the CRP estimates was spent on the 2012 election campaigns. The second number: 50 Million, that is 50,000,000. 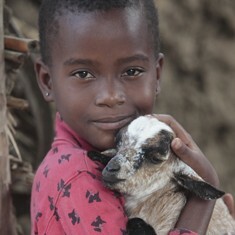 The number of goats that my favorite international charity, Heifer, could have provided to impoverished families with that amount of money. Why goats? Well, because goats are useful. They provide milk and manure while alive and meat and hide when dead. And they reproduce more goats which provide more milk, manure, meat, and hide. Time for an emotionally charged picture. So for the price of 50 million goats for people who simply need food and milk, we have nearly the same government today as yesterday. This excess of campaign spending is unconscionable in every sense. You should both be ashamed of yourselves for allowing and participating in this excess. Don't allow this to continue. In the future, when you see or hear a political ad, turn off the tv, turn off the radio, put down the newspaper. Just walk away. If the ads don't reach people, they will stop paying for them, and just maybe that money will go to someone deserving. And when you go to open your wallet and donate to a politician's campaign, please take a second to consider the goat instead. To expand on yesterday's post, I want to explore the possibilities of disaster that Disney could visit upon Star Wars. So let's figure out what makes Star Wars so iconic and how Disney could screw it up. Story: Hmmmm. Not particularly iconic. Really, it's just the standard mono-myth wrapped up in some special effects. Orphan leaves home, encounters wise old man who teaches him magic, rescues the princess, defeats the evil sorcerer, and saves the kingdom. Ya know... I think Disney has that story down. Music: Pretty damn iconic. It redefined music in film. As far as I know though, John Williams is still composing, and Disney has a pretty solid track record of music in films. Setting: A long time ago in a galaxy far, far away. Pretty good opening words. In fact, most of Star Wars' 'science fantasy' setting is iconic. Swords and sorcery, floating cities, forest moons, and strange inhuman creatures. Hmmm... I think Disney has all that pretty well covered too. Oh! Characters! This is a big one. Star Wars has many of the most iconic characters in all of cinema. Emperor Palpatine, Grand Moff Tarkin, Darth Vader, Obi Wan Kenobi, Yoda, Boba Fett, Jabba the Hutt, R2D2, C3PO, Chewbacca, and Han Solo. That's quite a list. But here's the thing. Most of them are dead! In fact, they are largely iconic characters because they are dead. They lived, they were awesome, they served their purpose, and then they died. They didn't keep playing the game even after they'd become obsolete. You may have noted a few omissions in the list. Well, let's face it, Luke and Leia are not iconic. The characters are straight from the Greek mono-myth and the acting and dialogue were average at best. Sorry, Mark and Carrie, but it's true. In any case, Disney can't ruin the dead characters, because they're dead. As for the living ones... R2D2 and C3PO were jokes to begin with, stolen directly from Akira Kurosawa's Hidden Fortress, so it would be pretty hard to damage those characters any more than the prequels did. And Chewbacca is a costume that growls unintelligibly, so that's hard to screw up. Which leaves Han Solo. Hmmm. Ok, that could be tough. Harrison Ford isn't exactly spry anymore... So it looks like we found the small thermal exhaust port after all.